* Assess yourselves! Know your weakness and your strength. Its only after knowing your capabilities, you can further your preparation process. Also, the assessment will help you to understand your areas of focus. * Devote your time keeping in mind your focus areas. Like if you are strong in Maths and weak in English, try to focus more on English than Maths. * To strengthen your preparation in areas you think you are not confident about, refer to good books as advised by the experts. You can also clear your doubts with your teachers and seniors who have earlier opted for SSC. 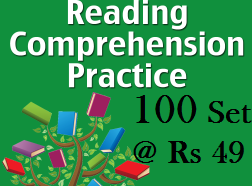 *Books on Reasoning like RS Agarwal (Verbal and non verbal), Marksman Reasoning, Pradeep Books, Dr Professor Solved Papers,verbal nnd non verbal reasoing by arihant, Solved Papers by Kiran S Publications are considered to be a great help to students preparing for SSC exams. *lucent's general english, Wren & Martin, Comprehensive Grammar by Eckersley & Eckersley, The Blue Book of Grammar, Warriner's English Grammar, English Comprehension by Raymond Murphy are among the good books on Comprehension (English) which you should follow. *Judge your style of learning. Choose books accordingly. Never pick books randomly. Proper selection of books is really essential. Also refer to previous years question papers and try to solve the questions in each section. It will give you a clear idea of possible questions for each section. While solving the sample or previous years question papers, do not forget to keep a note of all your queries and doubts. Clear all problems encountered, do not keep anything pending. At the preparation level, test yourself for how much time you take to complete each section. Note the section in which you take considerably more amount of time than should be necessarily allotted for the same. Once you have identified the section in which you take more time to complete, device strategies to better manage time and complete the particular segment in a shortest span. You can also speak to experts in this respect. And while taking the examination, remember to stick to the strategies deviced for better time management. Attempt those sections in which you are more confident and better prepared, first. Make Revision a practice at your preparation level itself so that it doesn't feel a burden during the examination also. Last but not the least, always remember that practice makes a man perfect & there is no substitute to hard work, so practice a lot. ALL THE BEST!